I followed the tutorial exactly with the exception of a few adjustments because of the supplies I had on hand. I only made two adjustments – I used clear packing tape instead of white masking tape and I used tissue paper instead of tracing paper. 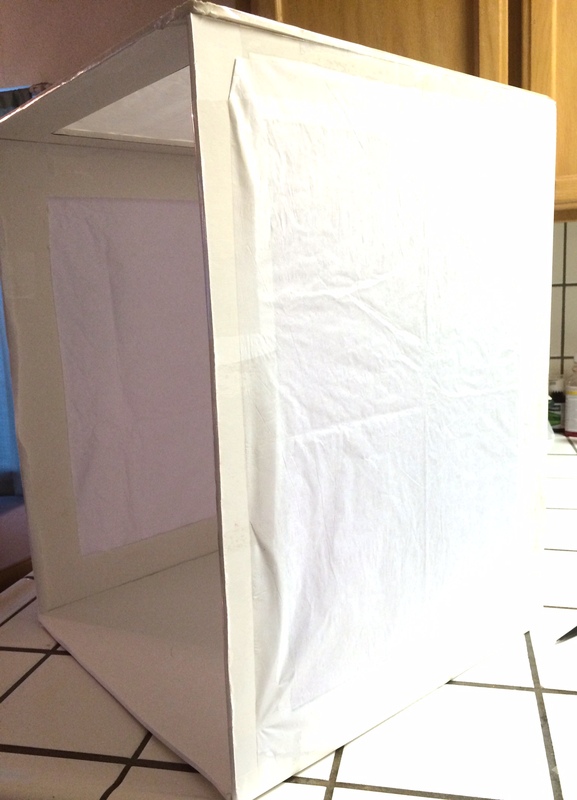 I used clear packing tape and tissue paper on my original light box and never had a problem. 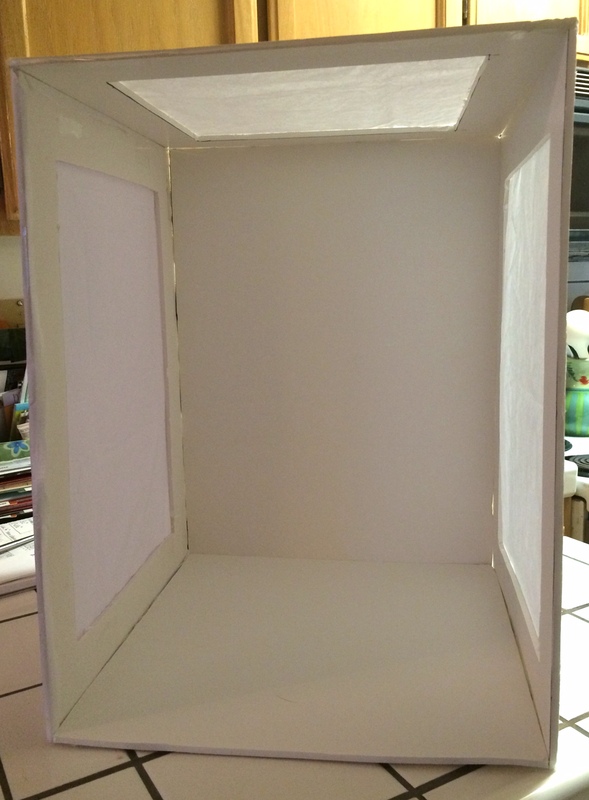 I cut up the foam core into 3 – 15″X20″ and 2 – 15″X15″ pieces. Out of two of the 15″X20″ pieces I cut out a section in the middle leaving me with a 2″ border all around. I also did this to one of the 15″x15″ pieces. Then I taped the tissue paper over the three cut out sections. I doubled up the tissue paper to give it the look of tracing paper. It also strengthens the tissue paper making it less likely to poke your finger through the paper – like I did with my original light box ;-). After all the tissue was attached, I (with Mike’s help) taped all the sides together. There are a couple spots that I’ll need to cover with a bit of tissue paper because I’m not a very clean cutter with the Exacto knife, but overall I’m pleased with the box. It’s much bigger than the first one I made and makes such a difference when taking pictures of product for my Etsy shop. I don’t think I’ll fit. 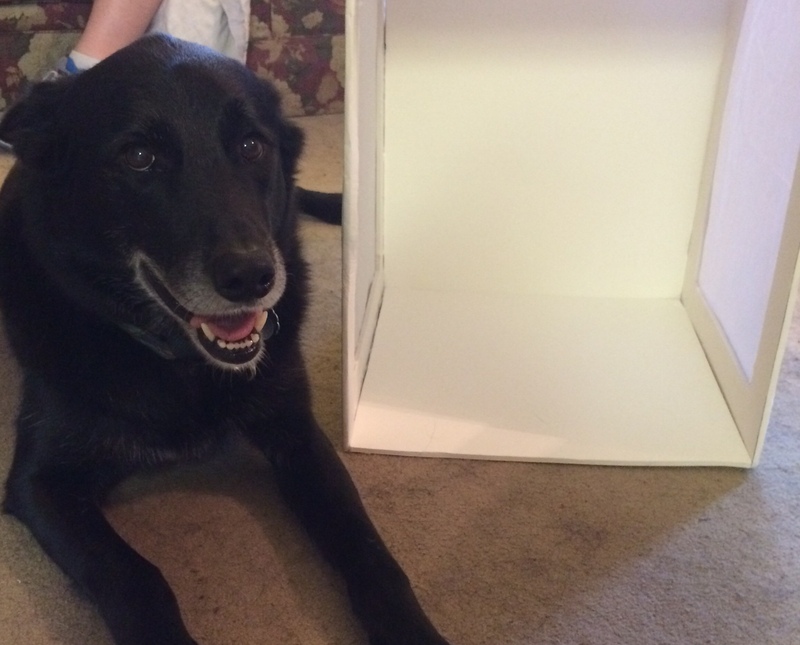 This entry was posted in Accountability, Challenges and Contests, Goals, Homemade, Make Madness, Pinterest, Saving Money and tagged accountability, Challenges and Contests, goals, homemade, make madness, Pinterest, saving money. Bookmark the permalink.